OSWEGO, NY – Two Oswego firefighters graduated from the New York State Fire Academy Basic Recruit Class on May 13 in Montour Falls. 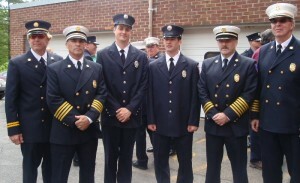 Attending the recent graduation were Chief Joseph Perry, First Assistant Fire Chief Jeffrey McCrobie, Deputy Chief Thomas Miller and Captain Donald Dowd. Firefighter Donald “Andy” Rockwood and Firefighter Eric Hitchcock both successfully completed the 11-week training course that included all phases of firefighting including live fire, Haz Mat, physical agility, and rescue techniques. Rockwood is a 2003 graduate of Lowville Academy & Central School and a 2007 graduate of SUNY Oswego. Hitchcock is a 2004 graduate of Oswego High School. Both were hired by the Oswego Fire Department in early 2010. “We are pleased to have both Andy and Eric back on shift after a very successful experience at the Fire Academy.Â Their success down there will carry over to their everyday work here at the Oswego Fire Department and we look forward to working with them,” said First Assistant Fire Chief Jeffrey McCrobie.